The Weather Channel (not the National Weather Service) has decided that winter storms need names, in the same way hurricanes and typhoons need names. Blizzards and hurricanes don’t care what they are called but evidently TV producers feel their coverage is more compelling if we are able to somehow humanize dangerous meteorological phenomena, which is interesting because effective propaganda generally dehumanizes the enemy. This most recent storm was given a TV name and many people will use it when they look back on this historic nor’easter. They got hammered and maybe it will help to have a name to shout as they shake their fists at the sky, but step away from the news and the roads and the towns and it was just more wind and snow. Fish in a Barrel Pond escaped the worst of the snowfall, but the wind was fierce. 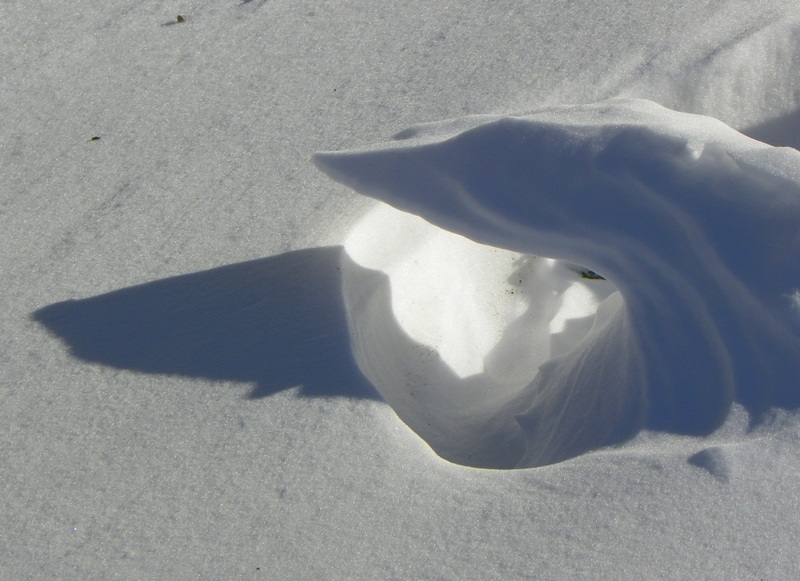 In the yard, loose snow was driven into drifts that solidified in the desiccating gale. Blasted by ice crystals, layer after layer was scoured and sculpted as the storm raged for hours. 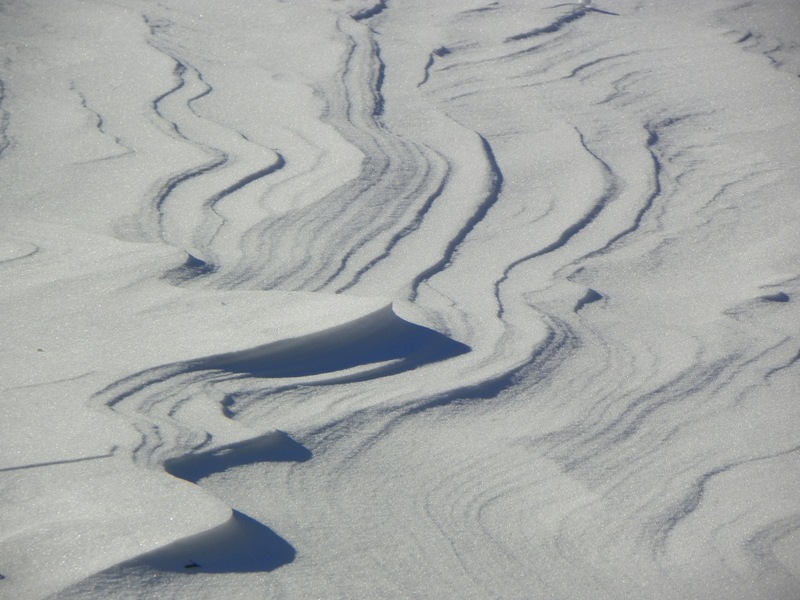 More solid than fluffy, the drifts snaked their way across the drive and up the hill. Below the barn they rose like waves six feet high at their crests, with bare ground exposed in the troughs. 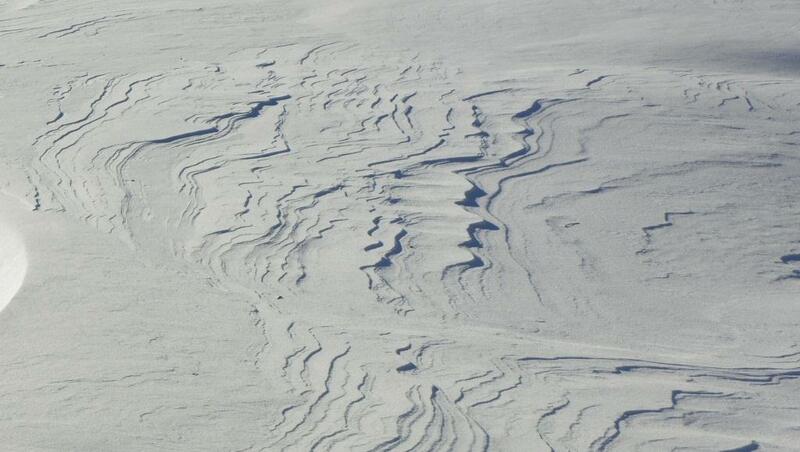 For more than 24 hours the wind blew, gaining force after the worst of the snow had passed. Grabbing edges and feeling for soft spots, it twisted and spun along contours, shaping fantastic forms as it went. 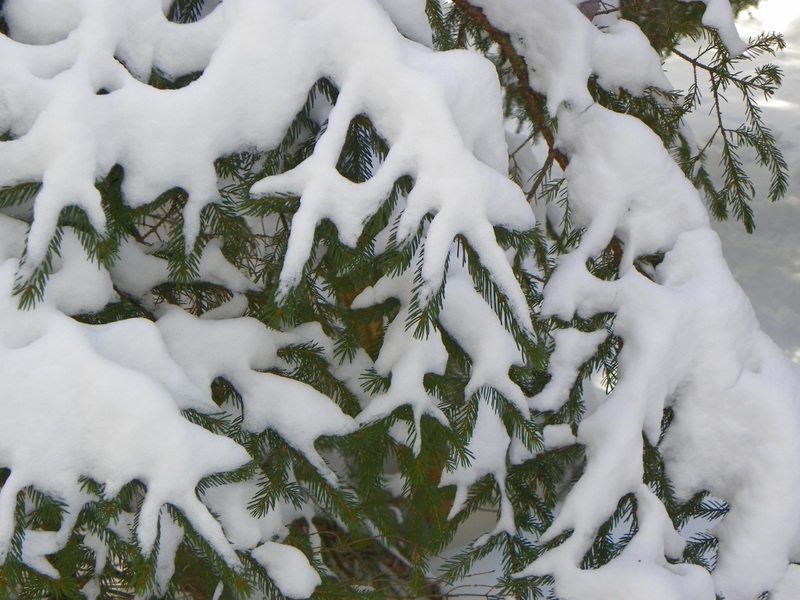 Thick with snow, the air turned to froth as it whipped through the trees and shattered flakes sifted down, settling on branches and drying in the cold. 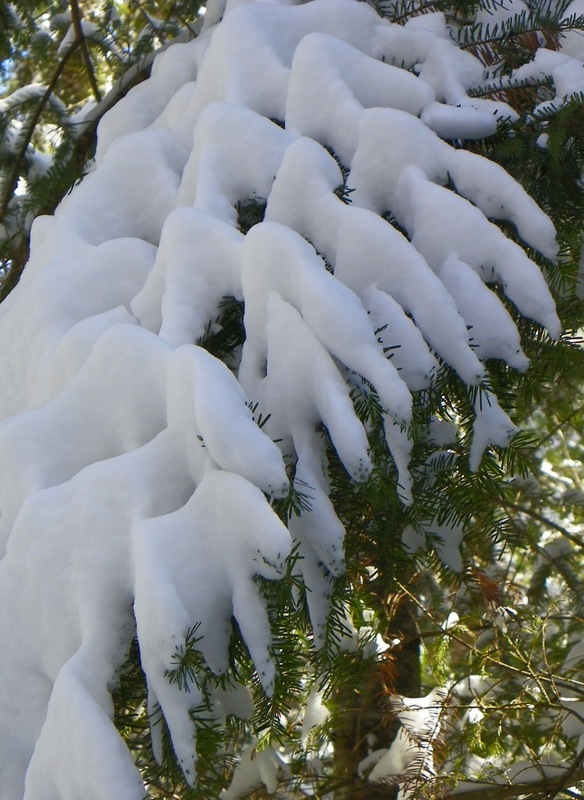 Intertwined shards of snow crystals fused into a solid mass that clung to the trees even as the sun came out and the temperature rose today. 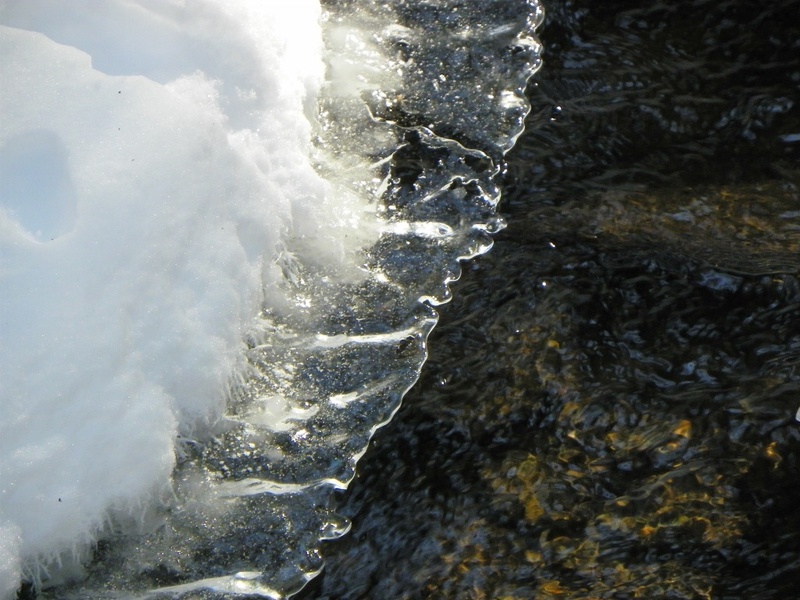 Water again flows in brooks that were frozen solid two weeks ago, while cobbles and stones wear crowns of snow. When a storm like this hits and people can’t get where they want, they look for someone to blame even though they know it’s no one’s darn fault. In the woods the animals just hunker down where they are and wait for conditions to change. 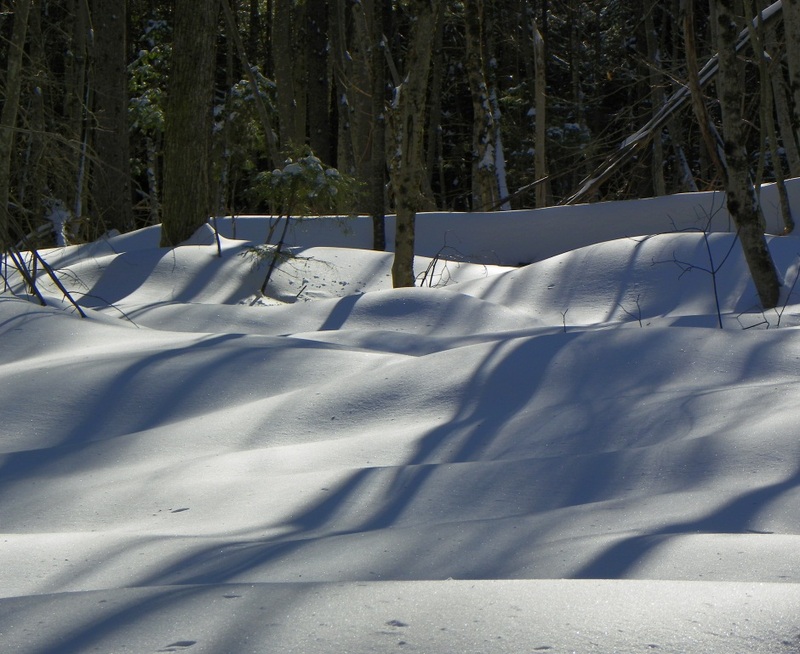 Moose, deer, and coyotes find sheltered spots to settle in, while grouse and other small animals take cover beneath the snow, even traveling below the crust in spaces created by the branchy skirts of small trees. An otter left the only tracks seen today, bounding up from the brook beneath an old bridge. If it had gone the other way this track would be smooth, packed by the otter’s belly as it slid down the slope. As the weather warms this week more critters will be on the move but for now the woods are trackless. 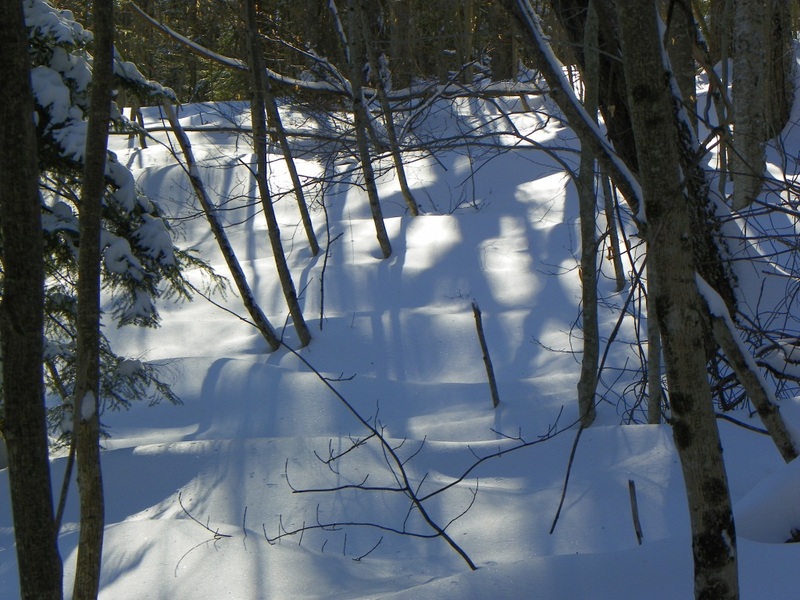 Undulating blue shadows give form to the drifts, which roll gently in the shelter of the trees. The inhabitants of the woods surrounding Fish in a Barrel Pond are more concerned with surviving another day than what a particular storm was called. It’s us humans that are all hung up on names but now that the road is plowed and my driveway clear, I can say I’m ready for the next storm, whatever it is called. I’m sure I’ll have a pet name or two of my own. 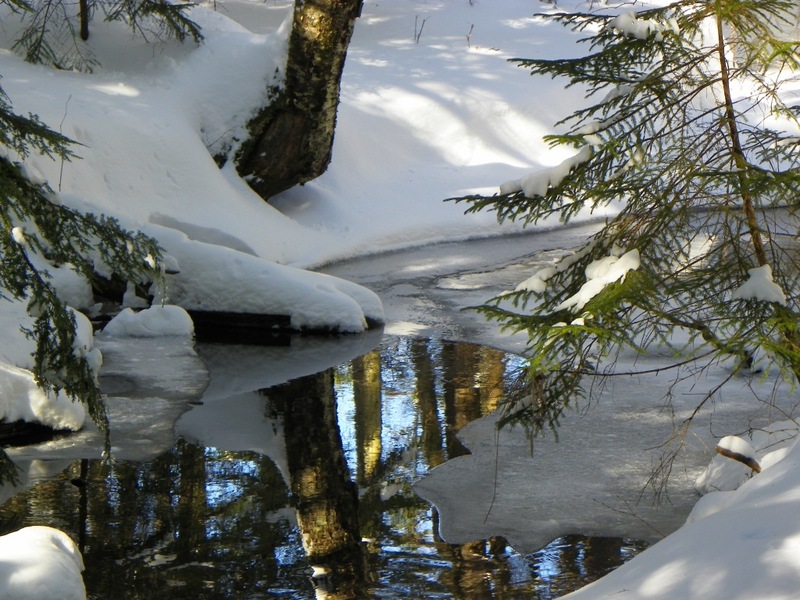 Nice photos… did you snowshoe to get them? Thank you. 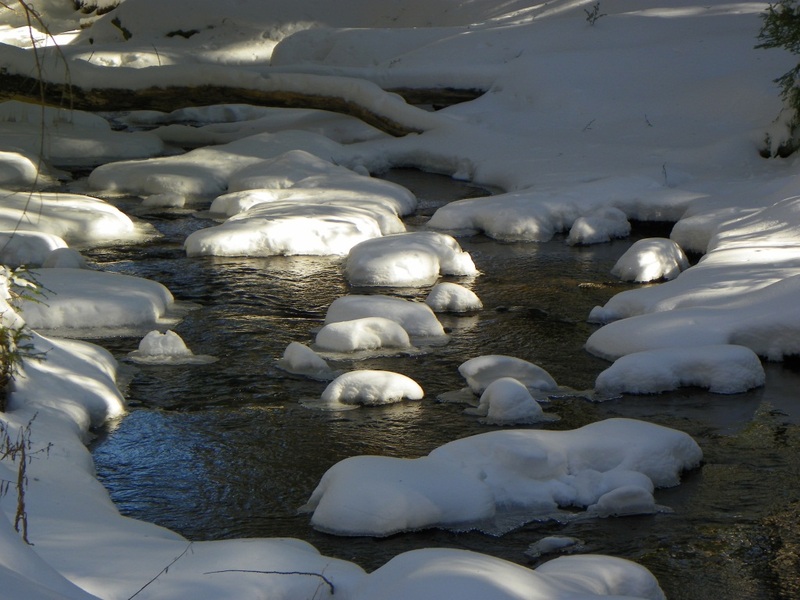 It was definitely a snowshoe day. I went without for part of the afternoon but did more wallowing than I like. 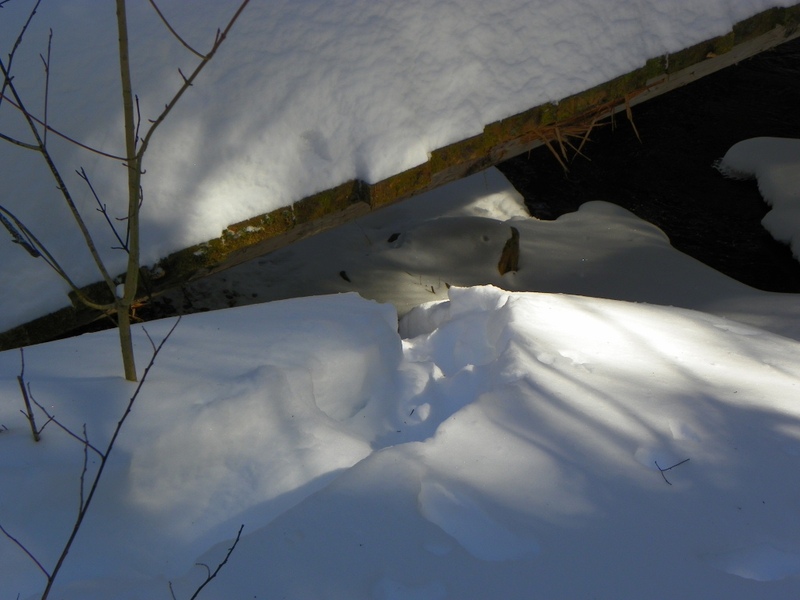 Snowshoes make the impossible difficult and sometimes that is all one can ask. Color those top photos yellow and brown and you have a desert. Glad to see you survived it, whatever it was called. The extra ‘s’ makes all the difference because the snow is a good consistency for drizzling with warm maple syrup as a tasty dessert. 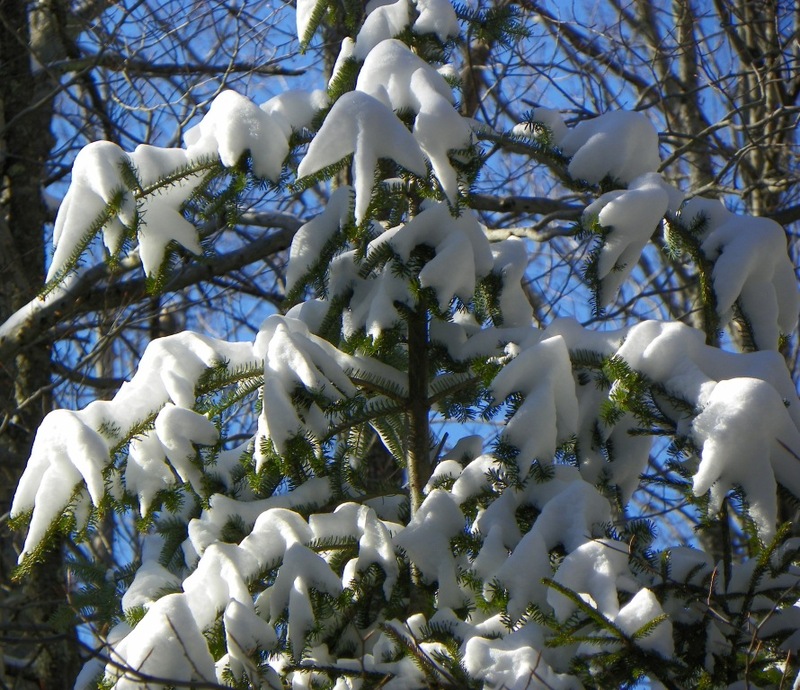 People think Vermonters are odd for eating snow like that (among other reasons) but it might just be another excuse to eat syrup (as if one was needed). Some swear that sugar on snow is not complete without a nice dill pickle on the side. When a storm is coming I am like the little bunnies, hunkered down and waiting. Really enjoyed this Quill. Next thing you know those crazy cooters will be naming earthquakes and volcano eruptions! Glad you enjoyed this. We got another four inches of snow this morning but now we have rain. Thanks for sharing the great pictures of the storm. Can’t bring myself to like what you have just went through, but, the snow is beautiful in its own way. Happy to hear you endured the storm. I have come to appreciate extremes, I guess. Doesn’t necessarily mean I like them, but I can appreciate them, especially when the aftermath is as lovely to look at as this. If nothing else, I still have my endurance! That’d run all the way down past your belt buckle. Leaving “I survived 2013” visible above the belt. Not a bad outcome, in and of itself! If I keep it up, sitting in my chair and eating ham, I will one day be able to fit all that across the front of a shirt with no trouble at all! That would fit on any T-shirt and covers the bases for all kinds of winter-related silliness. Another nice job,Mr.Quill. Although it’s hard to gain your perspective until you’re done shoveling the stuff.